Lately, I’ve been trying to figure out how to create a superview-like feeling when watching footage. Whether it’s the GoPro shot in 4:3, or it’s footage shot on a competing camera that I want to have that same feeling, I’ve been trying to figure out how to trick audiences into having the same feeling that you get when watching superview. Why would I do this? Well.. I’m under the impression that superview is required for FPV videos. The exponential scaling from the middle of the frame out is what gives it that dreamy feeling, and the wider, dynamic FOV from middle out gives a feeling of “stability” in that the center frame SEEMS to stay more steady. GoPro is the only product out there that provides this feature in camera, but is there a way to fake it with other cameras on the market? That’s what I’ve been tinkering around with. In a previous article, I played around with the process of making 4:3 GoPro footage into superview, but my next goal has been to take other competitors footage, and trying to make it feel as close to GoPro footage as I can. The footage uses an ND8 filter (the day that I shot this could have probably used an ND16, but I didn’t have it handy). I got a small bubble in the filter that I didn’t realize was there until further investigation so please try to ignore the smudge. This was filmed 1080@30fps, wide FOV, with everything else stock. The ND8 filter helped stop down the light to help prevent the already oversharp RunCam 3S footage a little bit more milky. This could have been brought down another stop, but I just don’t have an ND16 filter handy that will work for the RunCam 3S. Learn more about ND filters here. The first step that I took in this process of correcting this footage was to address the color. RunCam has 0 controls available in body for the user to manipulate colors, so you’re pretty much stuck with what you get. In my opinion, the colors that come out of the RunCam are extremely oversaturated, and tend towards the blue end of the color spectrum. I leave the color balance in auto mode, because there is no way to simply set 5500 kelvin, which is what I do on the GoPro, which will work for most lighting conditions. Instead, you have to pick between a few presets, and all of those add way too much warmth or coolness. So.. the first thing that I did was pulled down the saturation. A lot. 20% to be exact. This kinda reset to what feels a little bit like GoPro Protune flat. In addition, on the original file, I also bring down the contrast. I find that the RunCam picture is extremely sharp and very high contrast, so bringing it down makes it feel a little nicer. 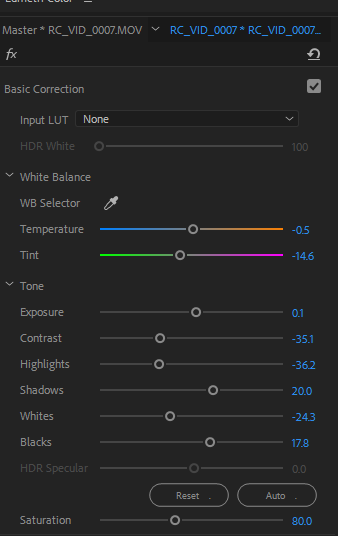 My personal taste is a very HDR look, so I bring down highlights and whites, and bring up shadows and even a little bit of blacks, since the blackest parts (again due to the high contrast) are extremely dark. Without any further work, this image does look a little bland, and a little bit ugly, but wait there’s more. Next, I add an adjustment layer on top of the footage that has been “blandified.” This probably isn’t necessary, but it’s the way that I choose to work on it. To that adjustment layer, I apply a LUT that was made for the GoPro Protune Flat Color profile that I also use for all of my GoPro footage. This adds a lot of depth to the image, brings out the highlights and colors, and makes a very very nice picture, in my opinion. However, when you first add it, it will be WAY to overpowered, so just bring down the opacity of the adjustment layer down to about 50%, and that should be a pretty balanced image. You can download the LUT that I use here. Finally, on the adjustment layer, I found that there were a few things that still needed a little bit of adjustment. Because we lowered our highlights and increased our shadows, I felt a little underexposed, so I added a full 1.3 of exposure, and then added about 25 shadows as well. This brought the image to roughly the same exposure level as the un-touched file, but now has a higher dynamic range and handles colors much much better. See the final product here. In my opinion, this is a much improved image as far as color space goes — there’s a lot that I would still change, but I’m much much happier with it than what comes straight out of the body. Now, let’s see what we can do about that horrible horrible fisheye attempt at superview. In an ideal world, to solve this, I would have used the RunCam 3S, shot in 4:3 without any fisheye affecting the final picture, and then digitally re-created superview like I did with GoPro 4:3. However, this is not an ideal world, and so we’re making the best that we can with what we have. To continue on this next step, please follow my other instructions on how to create that 4:3 image, and install the Elastic Aspect plugin for Adobe Premiere. These are the current settings that I’ve been trying that have given me the best results so far. I’m sure that these will evolve over time as I play with them more, but the first steps look pretty promising. I would argue that this looks much closer to superview than the original image, but I suppose it’s all coming down to taste anyways. 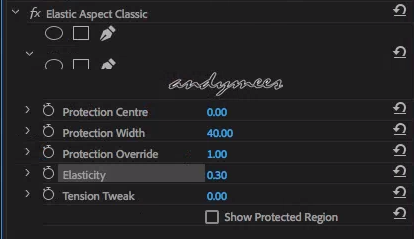 Tension Tweak: 0 (I haven’t found a good reason to ever change this in any of the clips that I’ve messed with this plugin. Any amount seems to have a very agressive result on the image that I don’t find to be very appealing, though I’m sure there’s a time and a place for it as there is with everything. And that’s it! Check out how the final product looks here, and let me know what you think. While this is all quite a bit of work to recreate something that’s already on the market, I really want people to be able to get the most out of their runcam, if they’re interested in putting in the work to get it there. This process is a little bit of a pain, but I think it takes a 4/10 image and brings it up towards a 7/10, where GoPro is the 10/10. The color quality on the first was much better than the last 2 videos. I calibrate my monitors for photography now it’s a given that we are all using unique displays – have 3 monitors all of the same build and near sequential serial numbers and all calibrate with different settings. I’m glad someone shared your page with your work here. With a 3S coming in the next few days I’ll definitely bookmark your site for future reading. Thank you so much for reaching out and saying this! I really appreciate that! I was kind worried that I was maybe wrong based on some feedback that I was receiving, but I personally like the look that I’ve established. If you need any further detail from me about what I did to manipulate the color, don’t hesitate to reach out via the contact page (http://paulnurkkala.com/contact) and I’ll see what I can do to help you out! This article provides clear idea for the new people of blogging, that in fact how to do running a blog. posts. Many of them are rife with spelling problems and I find it very bothersome to inform the reality on the other hand I’ll surely come again again. How about comment on how informative the post was because he did great on this one. yes thank you nurk for all the info . im so gutted that go pro has stop session and when i brake my ill be out of cameras . 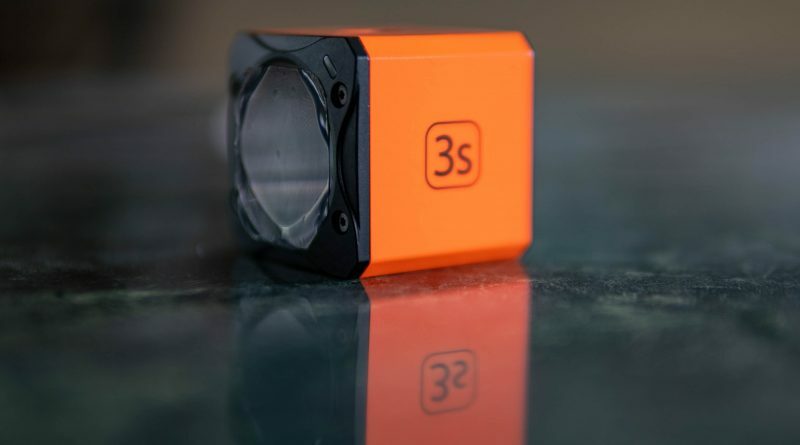 runcam 3s is a grate alternative unfortunately lack of superview is a deal barker for me . views of all colleagues concerning this post, while I am also zealous of getting knowledge.